Chords come in two basic flavors: major and minor. Minor chords have a darker sound, while major chords sound more upbeat. The G chord we learned above is a G-major chord. Next we’ll look at an E-minor chord (written as Em). Place your index finger at the second fret of the fifth string and your middle finger at the second fret of the fourth string. 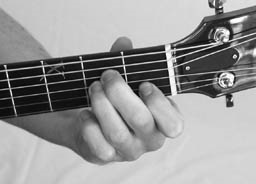 Position your index finger slightly farther away from the fret to make room for your middle finger. Strum the E-minor chord and notice the darker sound created by minor chords. 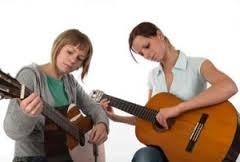 Now we’re going to try moving between the two chords you’ve just learned. 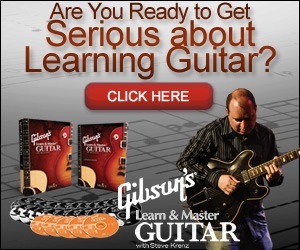 Begin by strumming the G chord. 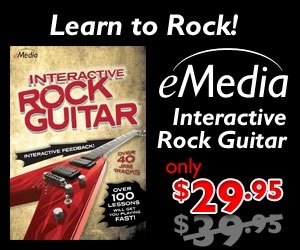 Next move your fingers into place for the E-minor chord as quickly as possible and strum it. Continue moving back and forth between the G and the Em, concentrating on getting each finger quickly in place. Initially your fingers will slowly find their places one by one to play each chord, but eventually they’ll pop right into place as soon as you think of the chord’s name. The key to speeding up your chord changes is repetition and practice, but a few tricks will help you out. Look at the fingerings for both the G chord and the Em chord. Notice that your index finger plays the second fret of the fifth string in both chords. You’ll save a lot of energy if you leave that finger in place while you move the other fingers into place to change chords. Also, your other fingers will find their places quickly because by leaving your index finger in place you’re maintaining a contact point–a reference with the fingerboard. You are using what is called a pivot finger, because the other fingers pivot into place around your index finger. Now try changing chords while strumming a steady rhythm. Start by strumming the G chord slowly and steadily four times–count “1 2 3 4” aloud if you like. Then move your finger in place for the Em chord and strum it four times, as in Example 1 below. To play this chord, place your index finger at the second fret of the third string, your middle finger at the second fret of the first string, and your ring finger at the third fret of the second string. There’s a new symbol in this diagram: the X’s above the chord indicate strings that are not played. To play this chord, you just strum the highest four strings. Play Example 2 to practice the D chord. Keep the strumming very basic and concentrate on your fretting hand. Example 2 is in 4/4 time (four beats of four quarter notes), so strum each chord four times. Again, keep the rhythm steady and make the chord changes as smooth as possible. When moving between the Em and D chord, you don’t have the benefit of a pivot finger, so you’ll need to depend on repetition and practice to get this change up to speed. 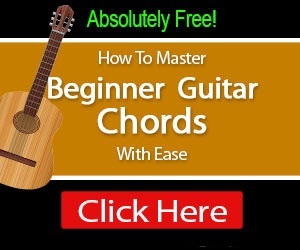 Click on the next page to learn even more new chords. Now let’s look at a few new chords. The C-major chord shown below is very common. C may be a bit more of a stretch than the others we’ve learned. Concentrate on getting the first two fingers in place, and then stretch the ring finger into place at the third fret of the fifth string. Notice the X on the bottom string, which indicates that string isn’t strummed. Now we’ll look at A-minor (Am). Let’s play a chord progression moving between C and Am (Example 3). When moving between the C and Am chords you can take advantage of two pivot fingers. Your index and middle fingers remain in place, while your ring finger performs the only movement necessary to make the chord changes. We’ll conclude with a few more basic open chords. Work on just one or two new chords a day. It takes a lot of repetition to program the muscle memory to play each chord quickly. The following chord is an A major. The challenge is squeezing all three fingers into a single fret on adjacent strings. You can practice the A chord in Example 5, which is reminiscent of the Beatles’ song “You’ve Got to Hide Your Love Away.” This one is in 3/4 time.